Oh, I love your boots! Where did you get them? This time of year, with its cold, snowy, icy wintry weather, necessitates pulling out my pair of prized boots, and with them comes the memory of a mysterious land far, far away. Each time I leave the house wearing my boots, I receive comments of interest from total strangers, people who would not otherwise speak to me—all because they notice my footwear. I never anticipated the Great Commission would take me halfway around the globe to a portion of geography shrouded in mystique. But on several occasions, from our home in Budapest, I had the privilege to visit our missionary leaders in Siberian cities with names like Irkutsk, Perm, and Krasnoyarsk. The thought of Siberia always conjures up, in the mind of westerners, horrors against humanity: Aleksandr Solzhenitsyn, gulags, work camps, frigid temperatures, and starvation. Sadly these descriptions are every bit real. Statistics overwhelm comprehension for the numbers of people who suffered severely at the hands of a brutal regime. One of our Russian friends recounted to us the personal story of both his father and grandfather who were exiled to a gulag in Siberia for preaching the gospel. Our colleague now represents the first generation in his family to be able to freely share the Gospel. Others related stories where prisoners suffered transport for countless days in boxcars. Upon finally reaching the middle of Siberia, they were tossed from the boxcar and given an axe and a shovel. These primitive tools were their only hope of survival in the subzero temperatures of this cruel terrain. The rare few survived, and lived to tell the story. Others did not. But their legacy lives on in the citizenry populating the late twentieth century Siberia which I visited. Today’s men and women are the descendants of thousands of Christ followers banished there decades ago; there are also children and grandchildren of the political dissidents and intelligentsia, even the artistically gifted, who suffered in Stalin’s Soviet Union. In the fabric of modern day Siberia, I discovered a population of bright, beautiful, hospitable people. Each trip reinforced my conclusion: these people are the best-kept secret in modern day Russia. They are wonderful! Staring down through ice which is 10 feet thick. But the story contains more than theory. I remember holding my breath, and climbing into the backseat of an SUV to experience multiple sliding donuts across the ice from inside this vehicle. Who would have thought? On the same trip, we visited a bustling outdoor market, and a pair of reindeer boots captured my attention. The kind, gentle Russian woman selling the boots had only one pair available, and fortunately they fit my American foot. Her statement stuck with me, and I remember the pride on her face each winter when I pull the boots out. I regret not asking her if he also killed and skinned the reindeer. This photo is with my co-laborer Cori who also made a purchase that day, but from a separate vendor. 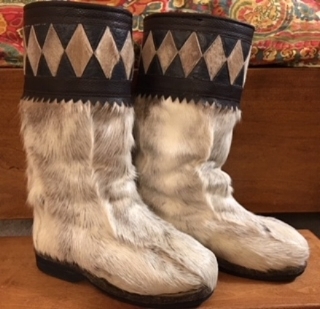 My Siberian reindeer boots are warm, strong, and sturdy, just like the people they represent. Each time I wear them, I feel honored to have a connection to a place and populace I admire and respect. What no eye has seen, what no ear has heard, and what no human mind has conceived— the things God has prepared for those who love him—(I Corinthians 2:9).